11 February 1910: Entered the Army as a Fahnenjunker in the Niedersächsisches Feld-Artillerie-Regiment Nr.46. 24 August 1914: Battery Leader in Field Artillery Regiment 46. 11 November 1914: Adjutant of the II. Battalion of Field Artillery Regiment 46. 25 February 195: Regimental Adjutant of Field Artillery Regiment 46. 2 June 1917: Deputy Battery Leader in Field Artillery Regiment 46. 4 July 1917: Regimental Adjutant of Field Artillery Regiment 46. 21 September 1917: Company Leader in the 2. Hannoversches Infanterie-Regiment Nr.77. 20 November 1917: Regimental Adjutant of Field Artillery Regiment 46. 24 November 1917: Officer of the Army and transferred to the General Command of the Flanders Naval Corps for employment as a General Staff Officer. 7 May 1918: Second General Staff Officer of the 35th Infantry Division. 28 November 1918: Returned to Field Artillery Regiment 46. 11 December 1918: Battery Leader in Field Artillery Regiment 46. 12 December 1918: Leader of the I. Battalion of Field Artillery Regiment 46. 30 April 1919: Separated from the Army. 1 August 1936: Supplemental Officer Candidate in the 1st Department of the Army General Staff. 1 October 1936: Called up as a Hauptmann of the Landwehr for provisional service in the 1st Department of the Army General Staff. 1 February 1937: Named a Supplemental Officer in the 1st Department of the Army General Staff with effect from 1 November 1936. 12 October 1937: Transferred to the 10th Department of the Army General Staff. 15 November 1938: Detached to the II. Battalion of Artillery Regiment 20 of the 20th Infantry Division. 10 May 1941: Commander of Artillery Regiment (Motorized) 33 of the 15th Panzer Division in North Africa. 17 January 1943: Army High Command Leader Reserve. 1 September 1943: Artillery Commander (Arko) 143. 5 April 1944: Army High Command Leader Reserve. 1 May 1944-5 June 1944: At the same time, detached to the 11th Division Leader Course at Hirschberg/Silesia. 1 July 1944: At the same time, detached to the Army High Command. 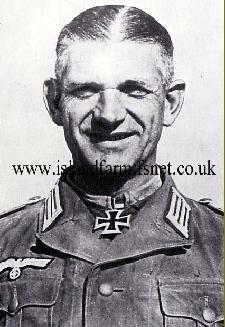 Knight’s Cross of the Iron Cross: 26 December 1941, Oberstleutnant, Commander of Artillery Regiment (Motorized) 33. Oakleaves (No. 683): 18 December 1944, Generalmajor, Commander of the 26th Panzer Division. German Cross in Gold: 1 November 1943, Oberst, Commander of Panzer Artillery Regiment 116. Prussian Iron Cross, 1st Class (1914): 15 October 1915. Prussian Iron Cross, 2nd Class (19141): 13 September 1914. 1939 Bar to the Prussian Iron Cross, 1st Class: 1 June 1940. 1939 Bar to the Prussian Iron Cross, 2nd Class: 30 September 1939. Mentioned in the Wehrmachtbericht [Armed Forces Communiqué]: 24 November 1944. Bender, Roger James & Odegard, Warren W. Uniforms, Organization and History of the Panzertruppe. R. James Bender Publishing, San Jose, California, 1980 (1st Edition). Fisher, Ernest F. Jr. Cassino to the Alps – The United States Army in World War II: The Mediterranean Theater of Operations. Washington D.C.: Center of Military History, United States Army, 1989. Ford, Ken. Osprey Campaign 74: The Rhineland 1945 – The Last Killing Ground in the West. Osprey Publishing Ltd., Oxford, United Kingdom, 2000. Ziemke, Earl F. Stalingrad to Berlin: The German Defeat in the East. Army Historical Series. Washington D.C.: Office of the Chief of Military History, United States Army, 1968. Oberst Gottfried Frölich commanded Artillery Regiment 78 from 1939-1943. Attaining the rank of Generalmajor, he was captured by the British at the end of the war while serving as Higher Artillery Commander (Harko) 313 of the 3rd Panzer Army. Frölich was later held as a prisoner of war at Island Farm Special Camp 11. Achieving the rank of General der Panzertruppe, Gustav von Vaerst was captured on 9 May 1943 while commanding the 5th Panzer Army in Tunisia. He was later held as a prisoner of war at Island Farm Special Camp 11. Launched on 5 July 1943, Operation “Zitadelle” sought to eliminate the Soviet Central and Voronezh Fronts defending the Kursk salient in a two pronged offensive. The German 9th Army (Generaloberst Walter Model) attacked the northern base of the salient while the 4th Panzer Army (Generaloberst Hermann Hoth) and Army Detachment “Kempf” (General der Panzertruppe Werner Kempf) advanced in the south. The Battle of Kursk is generally described as the largest tank battle in history. In mid-September 1944, Jäger Regiments 39 (L) and 40 (L) of the 20th Luftwaffe Assault Division were attached to the 26th Panzer Division and soldiered alongside it for the remainder of the year. The commander of the 20th Luftwaffe Assault Division, Generalmajor Wilhelm Crisolli, was killed by Italian partisans in an ambush near Modena on 12 September 1944. His replacement, Generalmajor Erich Fronhöfer, was later held as a prisoner of war at Island Farm Special Camp 11. General der Infanterie Günther Blumentritt was later held as a prisoner of war at Island Farm Special Camp 11. As of 12 April 1945, the order of battle of Army Group B trapped in the Ruhr Pocket consisted of Army Detachment “von Lüttwitz” (formed from the staff of XXXXVII Panzer Corps) (General der Panzertruppe Heinrich Freiherr von Lüttwitz) with the LIII Army Corps (Generalleutnant Fritz Bayerlein) and LXIII Army Corps (General der Infanterie Erich Abraham); the 5th Panzer Army (Harpe) with the XII SS-Army Corps (Crasemann) and LVIII Panzer Corps (Generalleutnant Walter Botsch); and the 15th Army (von Zangen) with the LXXIV Army Corps (General der Infanterie Carl Püchler) and LXXXI Army Corps (General der Infanterie Friedrich Köchling). Note: The XXXXVII Panzer Corps and LXIII Army Corps were originally components of the 1st Parachute Army of Army Group H; both were trapped inside the Ruhr Pocket and reassigned as indicated under Army Group B. On 21 April 1945, Generalfeldmarschall Model committed suicide near Duisburg, Germany.